Well guess what happened? I kept putting it off and eventually forgot what the recipe was! I literally told her how I’d make vegan hot chocolate, with some instructions to use trial and error to get it perfect, which is what I’d do if I were developing and testing the recipe in my own kitchen. 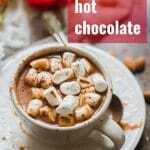 I finally decided to start from scratch and create a new vegan hot chocolate recipe around this time last year, but I never got around to sharing it on the blog. And that’s unfortunate, because you know what? It was awesome! Awesomer than any dairy-based hot chocolate I ever made, that’s for sure! So here it is, at long last. 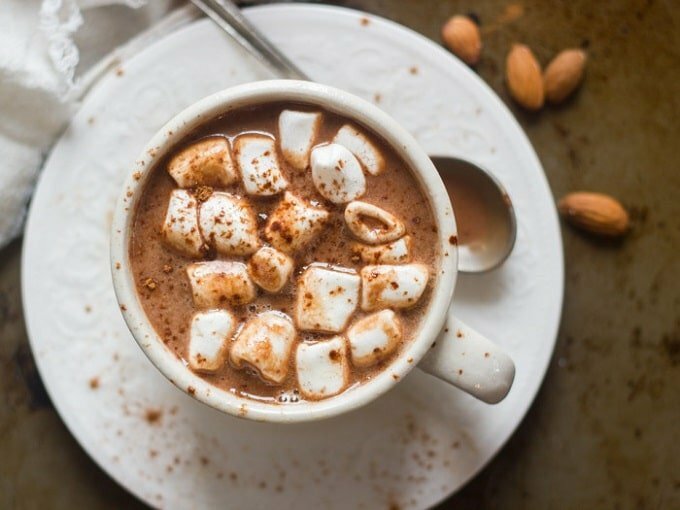 The secret to a killer cup of vegan hot cocoa? Chocolate chips. They work so much better than cocoa powder. 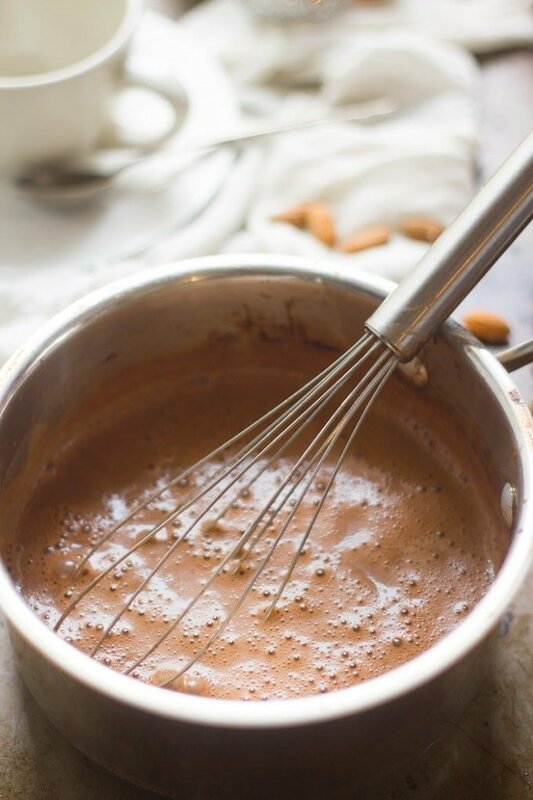 Seriously, melt those babies up in some non-dairy milk and you’ll end up with something that’s a zillion times richer and creamier than any dairy-based hot chocolate you ever drank. I’ve got to warn you: this stuff is super easy to make. You can whip it up in about five minutes, and if you’re someone who has all the ingredients on hand most of the time (like me), you’ll be tempted to make it again and again throughout the winter. Non-dairy milk, vegan chocolate chips, and maple syrup are technically all you need. Vanilla mellows the chocolate out and a pinch of salt enhances the flavor. I also like to include cinnamon and a of cay touch of cayenne pepper, but these are totally optional. Heat everything up on the stove until the chips are melted and the liquid is hot. That’s it! Vegan marshmallows make a great topping, if you can get your hands on them. 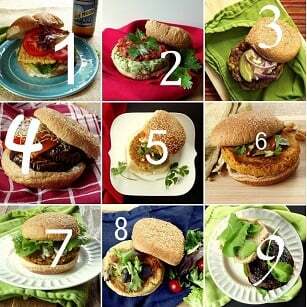 Try some flavor variations! I’m a big fan of the cinnamon-cayenne combination, but you can easily use flavor extracts like peppermint or almond instead to switch things up. 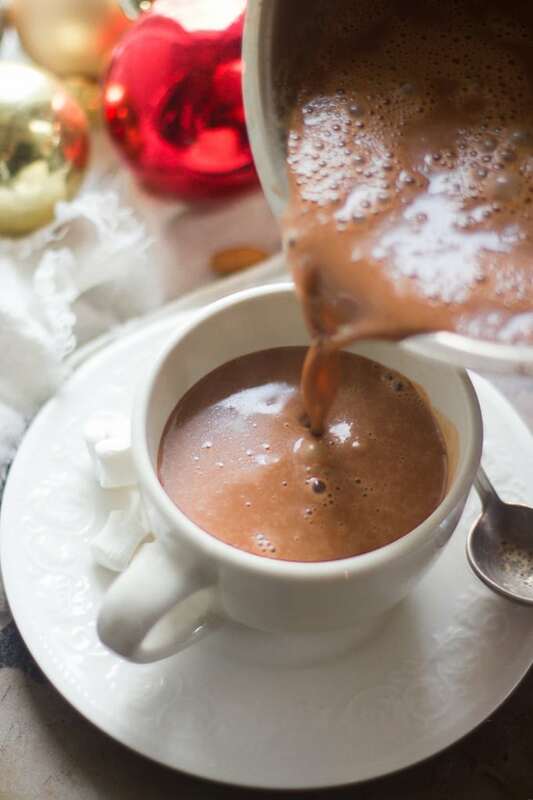 If you have leftover hot chocolate or just want to make it in advance, store it in a sealed up container in the fridge for 3-5 days. Then reheat on the stove or in the microwave. Where can I find vegan chocolate chips? There are a few brands out there, but I like Enjoy Life. If you’re lucky, your regular supermarket will carry them. If not, try places like Whole Foods or Amazon. And what about Vegan Marshmallows? I buy Trader Joe’s Brand or Dandies, also available at Whole Foods-type places and Amazon. 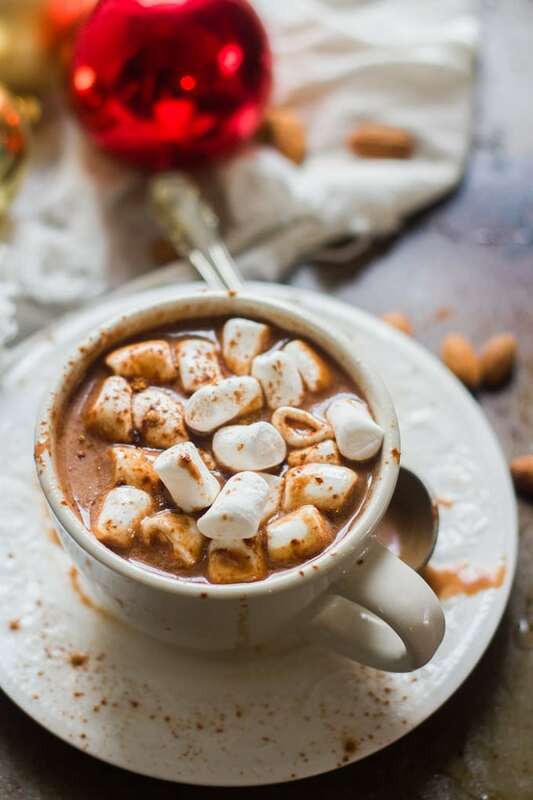 Watch my video to see just how easy it is to make this rich and creamy vegan hot chocolate! Place all ingredients into a small saucepan and set it over medium heat. Heat the mixture, whisking constantly, until it's hot and the chips are completely melted. Divide into mugs and top with vegan marshmallows. Have you found that one non-dairy milk works better for this recipe?